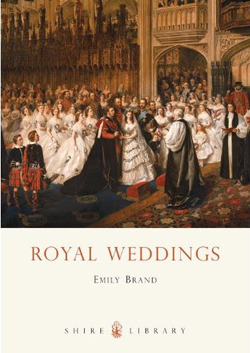 Emily is far too modest to use this space to publicise her recently-published book: Royal Weddings. It examines the history of some notable regal nuptials. Available from Amazon and all good bookshops. And maybe some bad ones too, who knows. It is clearly selling strongly, quite right too. To Wren the plaudits. His restoration of London’s churches and monuments along with able input of Hawksmoor, Hooke, Gibbons and others are remembered in all the history books and guides. But what of the more mundane? The shops, houses, factories? They didn’t build themselves. Less glamorous these projects may be, but some of their begetters were far from dull. No less energetic than Wren himself, these men were wheeler-dealers par excellence, with fascinating stories. Two exemplars who stand out are Nicholas Barbon and Thomas Neale. These men were what was then called “Projectors”, ie men who undertook projects. The closest modern equivalent would be Entrepreneur. Nicholas Barbon was variously an insurance magnate, MP, property developer, gangmaster, banker and noted economic theorist. The son of a pious non-conformist, one Praisegod Barebones (of Barebones Parliament fame), Nicholas initially studied medicine at Leiden and Utrecht and was admitted to the College of Physicians. But he abandoned the Physick to pursue a career in business and the business he pursued was insurance. In the wake of the Great Fire of London, the fledgling insurance industry was booming, as was construction, it goes without saying. Barbon immersed himself fully in both. Despite the Fire, England, and London in particular, was booming economically. Having gained superiority over her rivals on the high seas for almost a century, colonisation and trade provided plenty of opportunities for bold men with an eye on the main chance. The hub of all this activity was London. London needed more than rebuilding: it needed expanding too. But there were problems. The Statute books carried much legislation against new building and in addition there was plenty of nimbyism locally among Londoners themselves. Barbon simply ignored these impediments. He and his gangs of workers simply moved into areas and got building. Where necessary they demolished old buildings without permission. When opposed, they literally beat objectors into submission. Some of their buildings were jerry-built and collapsed. Most did not, and many examples survive on our streets today. 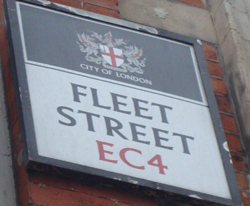 Barbon’s most notable developments were between the City and Westminster: the Temple area and nearby Essex House; Fleet Street. He also built near Cannon Street; Fetter Lane; Red Lion Square; Mincing Lane. For obvious reasons, Barbon was not popular; not just for his strong-arm methods, but also because his projects were often underfinanced and unsecured; he owed money all around town, defaulted on payments, borrowed from Peter to pay Paul, defrauded his partners. He used his position as an MP to shield himself from the courts. Yet he lived in a fancy house on Fleet Street and always dressed snappily: to look the part in order to play the part. In many ways he was a thoroughly modern man whom we would readily recognise today. Barbon didn’t care a fig for what people thought of him, brickbats simply bounced off his rhino-like hide. Despite his own dubious business practices, he fancied himself as an economic theorist, writing tracts such as Discourse on Trade (1690), propounding the idea that money has no intrinsic value. To Barbon, money was no less a tool than the chisels, hammers and saws used by his workmen. But unlike a good workman, Barbon didn’t really look after his tools, being heavily in debt when he died. Neal Street and Neal’s Yard in Covent Garden are named after another property developer who was the exact contemporary of Barbon and who was responsible for creating Seven Dials. Thomas Neale had a vision for the area to rival the recently constructed Covent Garden and fortunately for him he did not live to see the locality become one of London’s most notorious slums. He would perhaps be more happy today that a stroll up Neal Street is part and parcel of most trendy shoppers’ Covent Garden experience. Thomas Neale’s family came from Hampshire. He served the county in various capacities – commissioner here, JP there – in towns throughout the area, but the best platform from which to build one’s network of influence was as an MP. Neale’s parliamentary career began in 1668. Neale was obsessed with money and making money. Literally. Of the dozens of ventures with which he was directly involved, in 1686 he wangled himself the job of running the Royal Mint. Like Barbon, Neale’s modus operandi was to stick his fingers in as many pies as possible and if they produced cash directly, all the better. Chief among these was his own marriage. In 1683 he married a rich widow, Elizabeth Gould, whose fortune was estimated to be £80,000, a massive windfall at that time. Neale served on sixty committees in the Cavalier parliament, reports of which he passed on to his business associates. He variously speculated in ventures such as The East India Company and Royal Adventures into Africa. One of his plum appointments was groom-porter to the King, a position he held for life at £600 per annum. This job involved ensuring that all the paraphernalia of Royal gaming were supplied and up-to-scratch: dice, cards, gaming tables etc. The post also put him in charge of adminstrating gaming licences throughout the kingdom, with all the opportunity for abusive self-enrichment deriving: he granted himself a monopolistic licence for dice manufacture for some 14 years. Then there was the Royal Mint. Neale landed himself a post on the commission to investigate irregularities at the mint. At the end of the process, no surprise, Neale was put in charge of the Mint, at £500 per annum. Neale’s career as a property magnate involved urban development in the Shadwell area but he is better known for the re-development of the Seven Dials area, which with typical Neale brio, he maximised the profit potential. Rather than create a boring cross-roads configuration, he realised he could maximise the potential of shop rentals by creating a junction of seven roads. Brevity prevents us from exploring all of Neale’s capers. In 1693 he ran a £25,000 lottery; he received a grant to search for mines in the American colonies; with Nicholas Barbon (above) and others, he was a subscriber to the National Land Bank (which financed Seven Dials, lovely); he was granted a patent for wire screens used in flour manufacture; he set up the American postal service; and on and on. How could Neale possibly have enjoyed more careers than half a dozen lesser men would in a lifetime? The simple answer is that he didn’t. In most cases, he landed himself the job and then immediately appointed a deputy to do the work, examples being the nascent American postal service and the Royal Mint. for a list of Barbon’s surviving buildings, see Historic London by Stephen Inwood, pp 79-81. 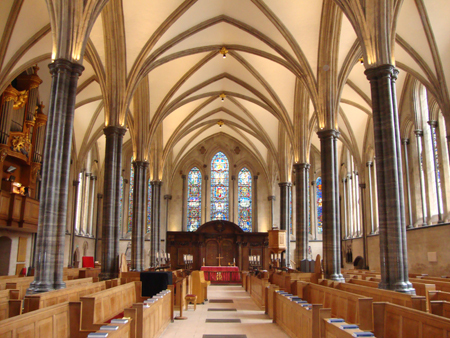 The Temple Church is one of London’s oldest, dating from 1185. Henry II is believed to have been at the consecration. 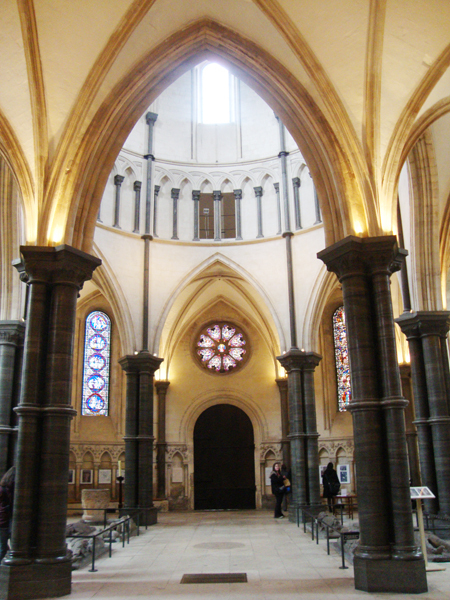 The original building – the Nave – is circular, the favoured design in contemporary Templar churches throughout Europe, following the Temple in Jerusalem. The main section – the Chancel – was added in the mid 13C. When in 1307 the Knights Templar were suppressed throughout Europe by the French Avignon Pope Clement V, egged on by King Louis IV, all their property passed on to the Hospitallers. In England, these in turn passed to the Crown when Henry VIII suppressed the monasteries. 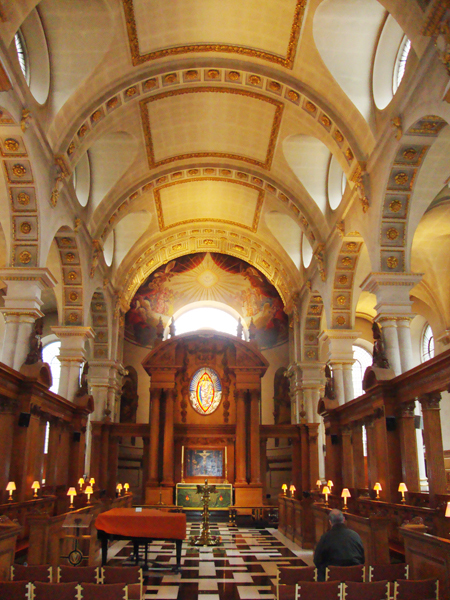 In 1608, James I handed the area over to lawyers of the Inner and Middle Temples with the proviso that they take responsibility for the Temple Church, a situation which remains to this day. One would imagine this is the reason that it is the Authorised Version which sits on every pew, but one would like to think that good taste came into it too. The lawyers have done a great job of keeping this church in impeccable condition. 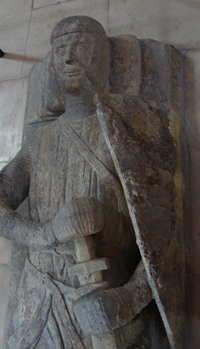 On the floor of the old nave we have eight stone monuments of medieval knights. On the north side of the Chancel is a wonderful modern pipe organ (the original 17C organ was destroyed in the Blitz) on which yesterday the organist was practising, belting out a rousing rendition of “Holy, holy, holy…”, among other old favourites. It may have dislodged tiles off a lesser church. The old Nave, facing West. 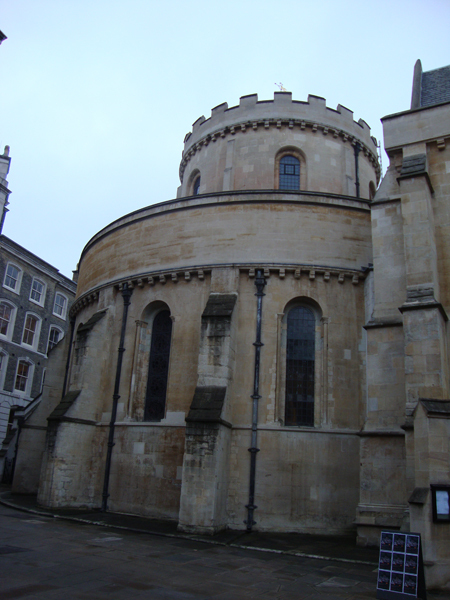 The Temple Church is based right in the middle of the Inner and Middle Temple district, immediately south of Temple Bar where Westminster and the City of London meet. It is open to the public for a few hours three or four times a week, but at irregular times, which can make planning a visit difficult (this was my third attempt). Entry is free for just another two days, for on 1 March a £3 entrance charge is being introduced. A sign of the times, but still worth it. Outside. 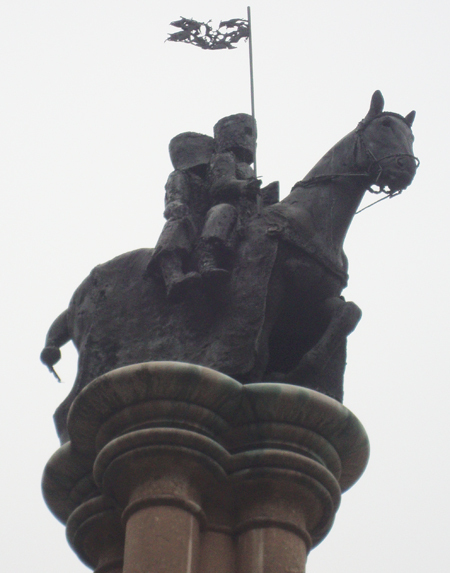 Two knights sharing a horse, a common Templar emblem. The Ludicrous London Stone: Is This the Best We Can Do? I can’t say I wasn’t warned. Russ Willey of this parish told me, quoting Dr Johnson (I think), “worth seeing but not worth going to see”. A fabulous piece of pith, which I can see myself recycling in the future. Well, Russ was only half right: it’s not even worth seeing. Or, to be precise, you can’t really see it at all. 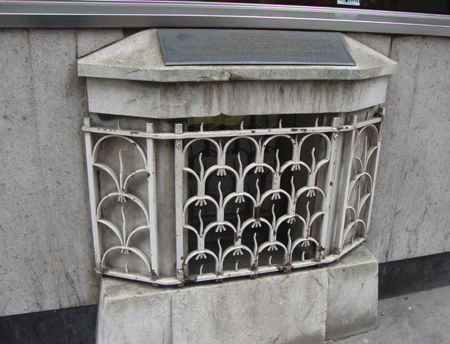 The London Stone resides in Cannon Street, virtually opposite Cannon Street tube. It is mounted at street level in the wall of a nondescript modern office block. 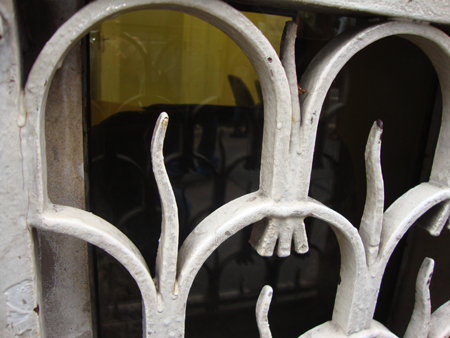 It is housed behind glass and protected by a cream metal decorated grille. It appears to be about the size of a large breeze block, but it’s difficult to say. Problem 1: The stone is behind glass, which at street level has obvious dusty consequences. Problem 2: The stone – bizarrely – has glass behind so that it can be viewed by the lucky office workers within. This just multiplies the reflective effect that makes the thing so difficult to see. Yes, we realise that it’s a dodgy mythological artifact of dubious provenance. But that’s not the point. It does have symbolical significance and if it’s going to be on display, surely we can do a better job than this? The London Stone, Cannon Street. The London Stone, that dark shape, right there. Peregrinations yesterday prevented me from writing this up. 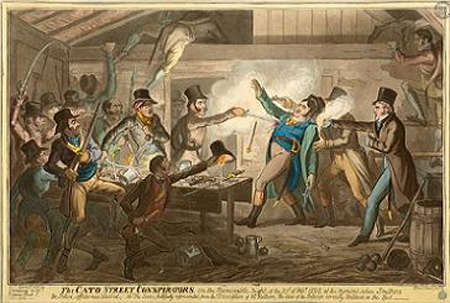 So, 24 hours late, we remember the arrest, on 23 February 1820, of the Cato Street conspirators, a rag-tag assemblage of radical malcontents who planned to assassinate all of His Majesty’s loyal Cabinet and to take over the government. George IV had been on the throne a matter of weeks. The social and political landscape in Britain was in a state of flux. Major continental wars had been settled for the time being and combined with the effects of the Corn Laws was causing unemployment and hardship throughout the land. The previous summer had seen the Peterloo Massacre, where the jittery authorities ordered a cavalry charge against a massive protest in Manchester. The resulting Six Acts, designed to force a lid on this pressure cooker situation, further radicalised angry reformers. One such was Arthur Thistlewood, an agitator with previous form. He became the leader of a conspiracy to murder Lord Liverpool’s Cabinet while they were scheduled to have dinner at the house of Lord Harrowby on the evening of 23rd of February. The plotters rented a house in Cato Street to serve as their rendezvous on the fateful evening. Unfortunately, their group – numbering nearly 30 – was too big to keep such a plan uncompromised. The arrest. Dramatic reconstruction by George Cruikshank. During the afternoon, magistrate Richard Birnie, along with twelve Bow Street runners, positioned themselves in the pub across the road from the conspirators’ lair. The lawman was expecting back-up from a unit of Coldstream Guards, but fearing that their prey was about to make a move, he initiated the raid. An almighty fracas followed during which one officer was killed with a sword. Most of the conspirators were arrested; a handful escaped, but were subsequently caught. Twelve of the conspirators were charged. 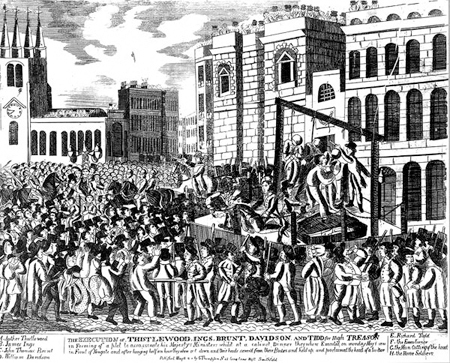 Five, including Thistlewood, were hanged and beheaded for treason on 1 May at Newgate. Of the remainder, a further five were transported for life and two had charges dropped in exchange for turning evidence against their comrades. The execution of Thistlewood and henchmen at Newgate. And so ended the Cato Street Conspiracy, whose repercussions could have been every bit as significant as the Gunpowder Plot 200 years previously, but has instead faded from the national consciousness. Last week, I finally got around to visiting Cato Street. Remarkably, in an area of uninspiring post-war apartment blocks and offices, the conspirators’ lair has survived, a tiny two-story Georgian building. I popped into town yesterday to meet some friends with their small daughters (four and five years old), and seized an opportunity also to do some history touristing. We all went to the new London Street Photography exhibition at the Museum of London. Being half term, the place was packed. So I shan’t do a proper review now, except to say that I would certainly recommend it. I shall re-visit and review it properly after half term. Entrance is free. From Museum of London, we took a stroll past St Bart’s, through Smithfield Market and down the Farringdon Road to Fleet Street. The children were getting a little bored and very slightly fractious, so we stopped for lunch at Ye Olde Cheshire Cheese, a first for me. This tavern is one of London’s oldest, dating from 1667. Among thousands of writers and newspaper types down the centuries, it was also a favourite of Johnson and Boswell. The place retains its olde worlde ambience without being overtly touristy. It has a saloon and a bar and a “chop house” (the restaurant proper). The fare is very reasonably priced. Fish and chips for a tenner, roast meal or sirloin steak for around £15, all good. The service was impeccable. I can see this place being something of a fixture for me in the future. I think a lengthy quaffing session with fellow historians would be just the thing. I bade my friends farewell and crossed the road to St Bride’s. Another first. St Bride’s is one of the better known of the dozens of Wren’s churches, superficially famous for its beautiful layered steeple, the inspiration for wedding cake design ever since. But this is just the icing, so to speak, of the St Bride’s experience. The crypt is shared by two small subterranean chapels and a museum, which is a treasure hoard of archaeology. The phases of the church’s existence are clearly explained with diagrams, maps and artefacts, the most recent of which date from the Blitz. The current building is thought to be the seventh or eighth on the site. But going back upstairs for a moment. Nothing not to like, really. Wren simplicity and plenty of light. This is, of course, the journalists’ church where they usually have memorial services for members of that trade. 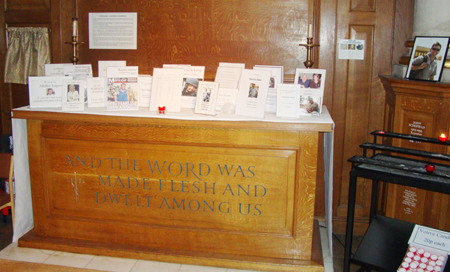 There is a small shrine in the north aisle for correspondents, photographers and crew recently – that is to say in the past 10 years or so – killed while covering conflicts around the globe. On the backs of the pews there are hundreds of plaques commemorating prominent, deserving and otherwise, members of the media trade. Some of the recent ones actually bear corporate logos, which is not entirely necessary in my view. Commemoration of journalists killed in the line of duty over recent years. The name St Bride’s actually derives from St Bridget, who is big in Ireland, that is to say, not the more eminent Swedish one. Archaelogical and other evidence suggests the first church was built in the 7th Century, during the Saxon period, but probably a Celtic foundation. Post-war archaeological digs have revealed many Roman artefacts which tell us that this immediate part of London was occupied during Roman times, albeit outside the city wall. One of London’s first print shops, that of Wynkyn de Worde (Caxton’s apprentice) was set up next door in 1500, the beginnings of this part of London becoming a major print and media centre in the centuries that followed. In the early sixteenth century, Henry VIII built his famous Bridewell Palace immediately to the south of St Bride’s. His son, Edward VI, donated the building to the City of London to be used as a poor house, hospital and prison for women. The word Bridewell subsequently got adopted by other prisons in Britain and indeed overseas, becoming more synonymous with a lock-up than a charitable institution. The damage caused to St Bride’s by the Blitz allowed for extensive excavation of the crypt after the war. This had been totally sealed up for a century or so as a result of people wrongly believing that disease-carrying miasma emanated from corpses. There, archaologists, led by Professor W. F. Grimes, discovered the foundations of previous versions of the church along with thousands of artefacts previously mentioned. They also discovered some 5,000 coffins. The bones from these have been examined in minute detail by experts over the past half-century. One of today’s leading experts is Jelena Bekvalec, Curator of Human Osteology at the Museum of London. She is giving a fund-raising lecture at St Bride’s on 17 March. Tickets are £7 or £10 on the door. More information here. The crypt. 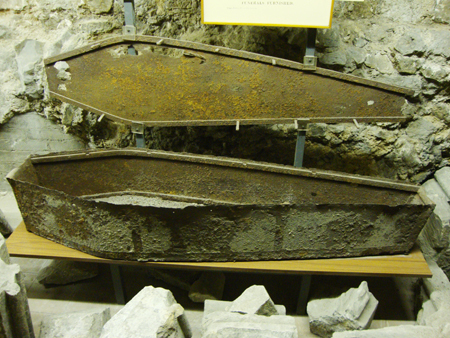 A metal coffin, designed to thwart body snatchers. These items were not popular with church authorities. When I was in St Bride’s I had the place virtually to myself. While in the crypt, examining the coffin plate of the 18C writer Samuel Richardson, a man carrying a box of Ritz crackers approached me. We started chatting and he spent at least half an hour telling me virtually everything which I have just written about St Bride’s. It turns out he is the Verger, David Smith. What a lovely man: I’m very grateful for his kindness and generosity.